When I first learned how to knit, the easiest patterns to pick up and finish were dishcloths and coasters. When you don't have that many stitches in your arsenal, it's always easy to just stick to the basics and knit a square. How was I to know that, as a beginner, I already had the resources I needed to start creating dishcloths with roses and other amazing designs? 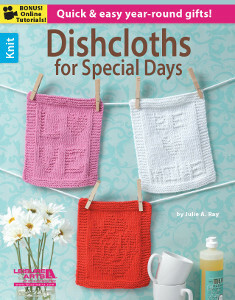 The unique patterns in Dishcloths for Special Days should be in every knitter's library. With each pattern only calling for knit and purl stitches, they are perfect for the beginner knitter ready to spruce up their plain Jane knitted dishcloths with fun designs. Are you a visual knitter who prefers to work with charts as opposed to patterns? Dishcloth for Special Days also provides a chart with each of their written patterns. The end of the book is filled with great information, such as the yarn types used in each of the patterns and how to read the charts. Dishcloth for Special Days isn't just a resource for beginners. It's great for knitters of every skill level. As you venture out to more complicated patterns, there's nothing wrong with taking a break and revisiting timeless knits like the dishcloth. After all, what kitchen is complete without them? This book contains 21 dishcloth patterns that span seven major holidays (including Christmas, Thanksgiving, and Valentine's Day). These decorative dishcloths can be used year after year, and some of the designs can even be put on display all year long. I guarantee you'll just love the personal touch they add to your kitchen. I know I do! Since these adorable patterns are quick to whip up, they also make the perfect gift for all of your loved ones. All in all, you can't go wrong with Dishcloths for Special Days. Win a copy of Hand Spun!